The 2019 International North West 200 will celebrate it’s 90th anniversary with new title sponsorship. ‘This is a unique opportunity and a great honour for our company to become one of the title sponsors of such a prestigious international event as the North West 200, especially in its landmark 90th year.’ William McCausland, Director of fonaCAB, said. Hugh Nicholl, Managing Director, is equally delighted the Nicholl Oils Group will be involved in such a high profile way in this year’s international NW200. 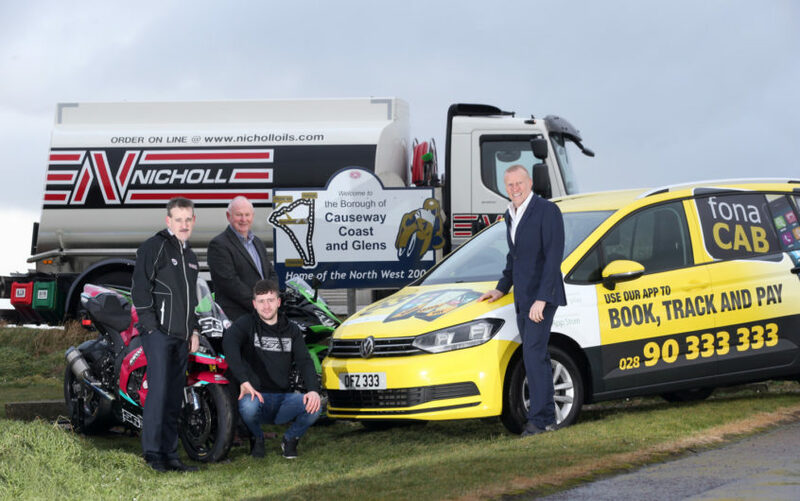 ‘We are delighted to welcome fonaCAB and Nicholl Oils on board in this very special year for the North West 200 motorcycle races.’ Event Director, Mervyn Whyte, MBE, said. • Our purpose is to provide a quality and professional service which is safe and available to all. Established over 50 years ago, the Nicholl Oils Group is an independently owned family business supplying petroleum products throughout the N. Ireland, UK and Ireland to domestic, commercial, industrial and retail customers. From small beginnings in a rural village on the banks of Lough Foyle near Londonderry it has grown to become one of the largest oil distributors in the UK and Ireland. Nicholl Oils group provides a full range of petroleum products and services spanning the Energy sector. Originally set up to provide oil to local homes and businesses in the North West of Northern Ireland, Nicholl Oils Group now supply petroleum products to Domestic, Agricultural, Commercial, Industrial, Marine, Governmental and Retail customers across the province, Ireland and mainland UK. Over the last 50 years Nicholl Oils has grown to become Northern Ireland’s largest independent oil distributor by providing their customers with a reliable, dependable service at competitive prices. From its Oil Import Terminal in Belfast they source oil products from all of the major oil refiners and traders across the world. A modern delivery fleet of nearly 100 tankers from network of 11 strategically positioned depots across Northern Ireland they provide its customers with the best, most flexible and responsive service possible. No matter where you live in Northern Ireland, you can rest assured that Nicholl Oils can provide you with a first-class delivery service delivering the highest quality products and the very best customer service from their local depot near you. It’s retail petrol brand “Star” provides local petrol forecourt owners with a modern, bright, trusted brand image for the supply of Petrol, Diesel, Kerosene and other fuels to retail forecourts. Nicholl Oils is also at the forefront of technology with the continuing development of its unmanned automated forecourt network under the brand image “Nicholl”. With sites in Carryduff, Belfast, Bangor, Mallusk, Omagh, Limavady, Derry, Ballymena and Antrim it is fast becoming a familiar site across the province. The “Nicholl” automated site enables customers to refuel petrol, diesel and adblue 24 hours a day, 365 days a year using credit/debit cards or cash. Most sites also have retail shops and other services like ATM’s and car washes.